Ashes: Did Mitchell Starc bowl 'ball of the 21st century' to James Vince? It is being described as the ball of the century. Admittedly, there's still a long time to go - but Mitchell Starc's delivery to remove James Vince on day four of the third Ashes Test was something special. 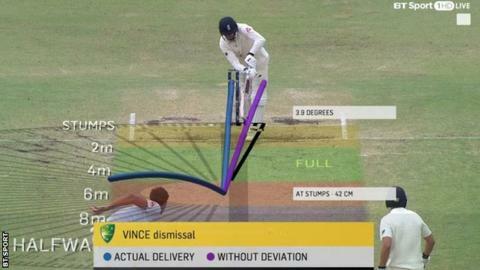 The left-armer went round the wicket, delivered a 90mph ball on a good length and watched it rip out Vince's off stump. Replays showed the ball, which hit a crack, would have gone down the leg side had it carried on its natural path. Instead, it left Vince's off stick uprooted. "That absolutely splattered the stumps," said former England spinner Vic Marks on Test Match Special. "It was like a 90mph bit of left-arm spin. "I think we can give Vince licence there. How do you play that? It was an absolute cracker." Shane Warne, holder of the unofficial award for 'ball of the 20th century' for his dismissal of Mike Gatting in 1993, asked his social media followers if it was the best delivery they had seen since 2000. Legendary Pakistan bowler Wasim Akram - himself a master of left-arm swing - weighed in too. Speaking on BT Sport, Starc's new-ball partner Josh Hazlewood said: "It was pretty special. It was heading down leg, hit the crack and took the top of off. It would get any batsman out." The delivery brought to an end a fine innings from number three Vince, which contained 12 incredibly well-timed boundaries. The elegant Hampshire right-hander was finally giving England's travelling support something to savour when he was 'Starc-d'. "James Vince played beautifully," said former England captain Michael Vaughan. "He plays pure cricket strokes. He's a lovely player to watch. "You felt it was going to be his day. Then, all of a sudden, he got what we are probably going to describe as the ball of the 21st century. There was nothing you could do about that." Ed Smith, another former England batsman, suggested the innings was as good as any in the match in terms of its style. "That was technically the best I've seen James Vince play," said Smith. "He is such an elegant player. "We've seen some superb batting in this match but none of them looked better than this." Vince, for his part, was quick to give full credit to the bowler. "It's still frustrating to get out, but it's easier to take than the ones you feel like you're at fault yourself," said Vince. "If I faced that another 20 or 30 times I think it would get me out every time. Give him credit there, sweep it under the carpet and move on." And move on England must. Quickly. After four days at the Waca, they were 132-4, still 127 short of making Australia bat again. Best since Bradman? How does Smith do it? Read more on Ashes: Is Steve Smith the best since Donald Bradman?